Honda Pioneer 1000 and 1000-5 Guide. Specs, Photos, Videos, and More. 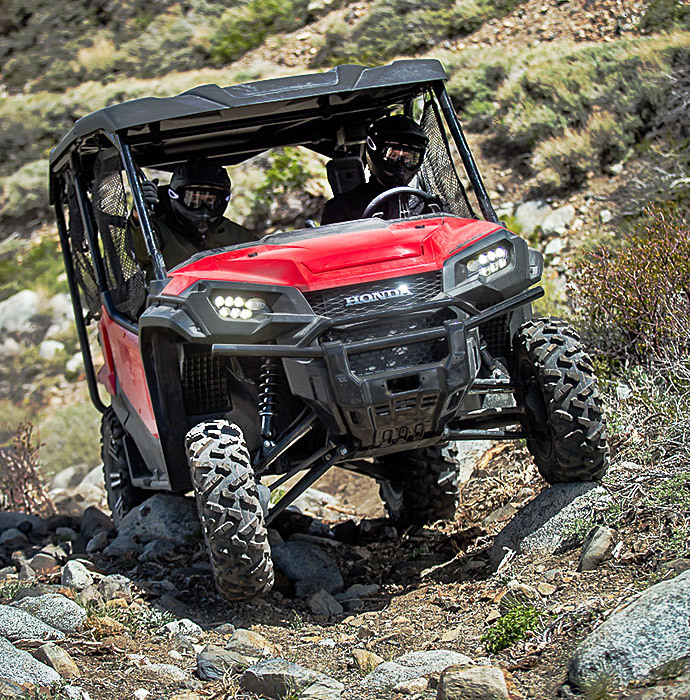 Honda Pioneer 1000 and 1000-5 Guide for 2019. 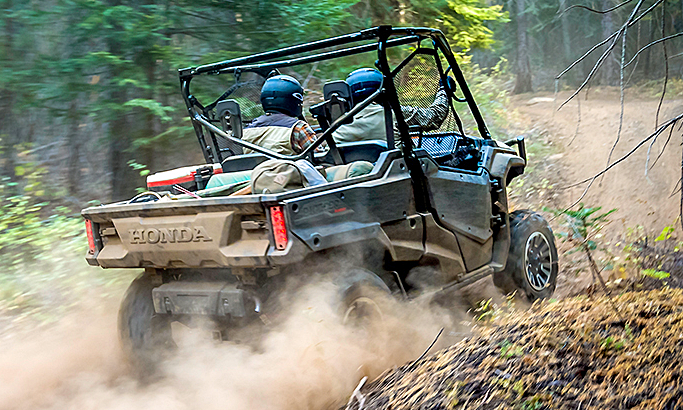 The Honda Pioneer 1000 and 1000-5 are back for 2019 with few changes. A couple of extra color choices, yellow on the 1000 EPS and Matte Black on the 1000-5 Deluxe. You can see the model highlights and features, along with 2019 prices below. 999cc liquid-cooled inline twin. Fuel injection, Unicam head for a more compact engine package. 6-speed Dual Clutch Transmission. Choose between manual mode or fully automatic. Plus, the addition of Sport Mode in EPS and LE models increases the fun, shifting at higher RPMs for a full-performance driving experience. Steering column-mounted paddle shifters in EPS and LE models. In Manual mode, they let you shift without ever taking your hands off the wheel, and in Automatic mode, they let you override the current gear with a quick up or downshift, holding that gear for several seconds before returning to Automatic mode. Don’t tear up sensitive surfaces. Select Turf Mode. Want to access as much traction as possible? Put it in 4WD. Need maximum power at all four wheels? Lock the front and rear differentials. You can do it all with a shift of a single lever. The brain of the DCT, Advanced Transmission Logic, senses how you drive and adapts. Relaxed drivers get earlier shifts for a quieter ride at lower engine speeds. Sportier drivers will hold each gear longer for higher RPM shifts. And when going downhill, you get true engine braking. 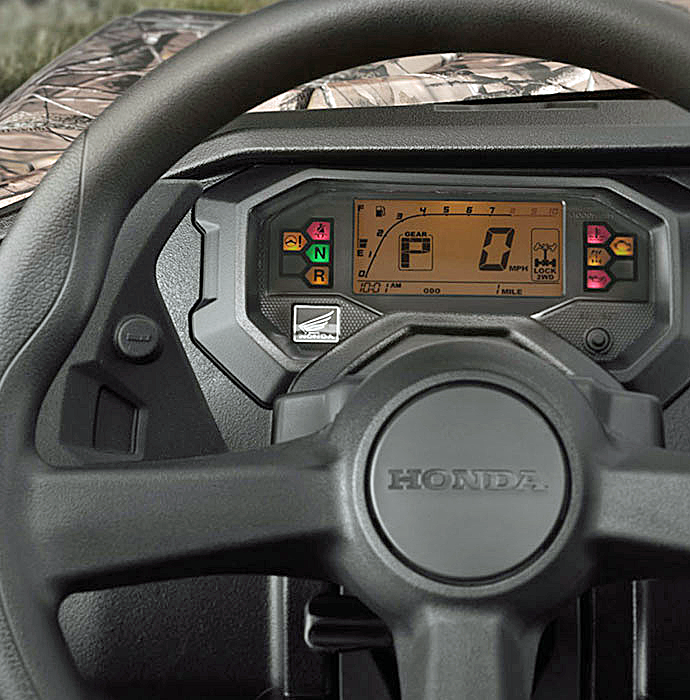 Honda’s Hill Start Assist automatically holds the Pioneer 1000 Limited Edition in position while you move your foot from the brake pedal to the accelerator—eliminates roll-back. 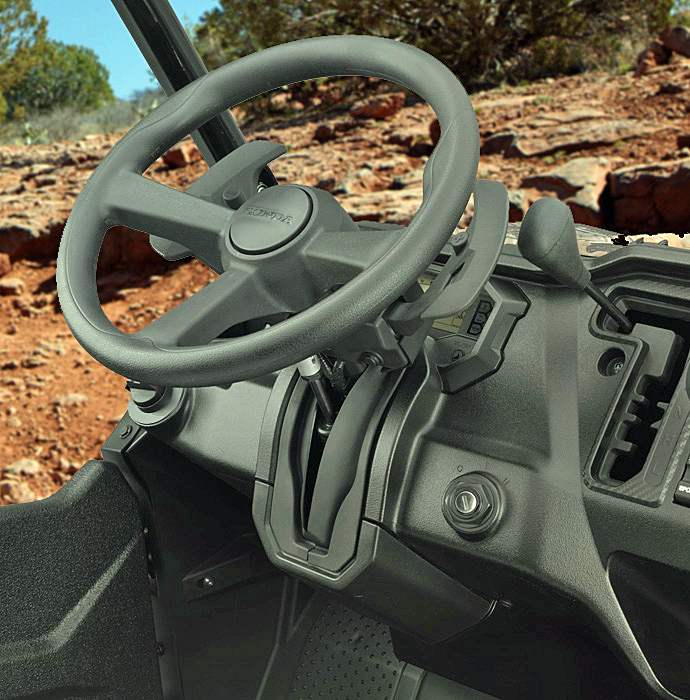 The Pioneer 1000 Limited Edition is equipped with the I-4WD system. It simplifies operation, increases drivability and optimizes traction. Using technology from Honda’s automotive division, it has the benefits of a locked front differential with none of the downsides. That means it maintains front-wheel traction even if one wheel wants to spin on ice or mud or if it’s in a hole. But at the same time, you get the lighter steering, better tracking at high speeds, tighter turning radius, and reduced kickback associated with unlocked front differentials. 27-inch tires on 12-inch rims - DLX model, you get Maxxis Bighorn 2.0 tires with radial construction. Dual A-arm suspension gives you 10.5 inches of travel in the front, and 10-inches of travel in the rear. Dual 210mm hydraulic discs front and rear. 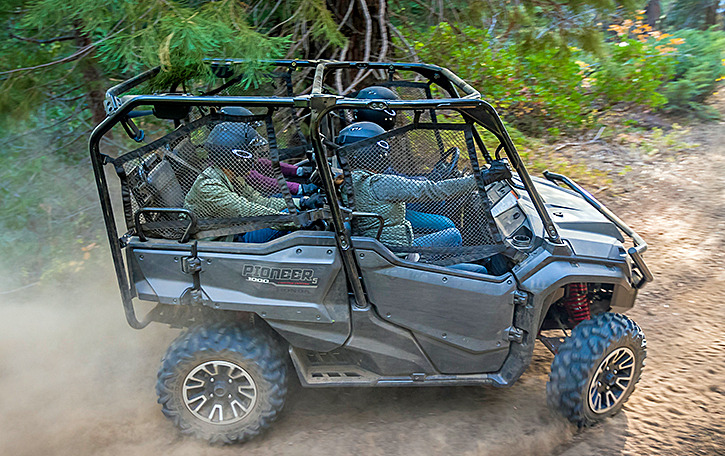 Pioneer 1000 Limited Edition gets quick-adjust FOX QS-3 shocks on all four corners. The Occupant Protection Structure uses large-diameter tubing, and meets OSHA’s rollover protection standard. The hard doors and roll-up side nets help keep debris from entering the cabin, and auto-style three-point seatbelts are equipped with an emergency locking retractor mechanism, to help optimize passenger security. Electric Power Steering system helps eliminate bump steer through rocky and rutted terrain, which reduces fatigue. Added assist when you need it most, like when in 4WD, driving at lower speeds, or maneuvering over rough conditions. Tilt Steering on EPS models. 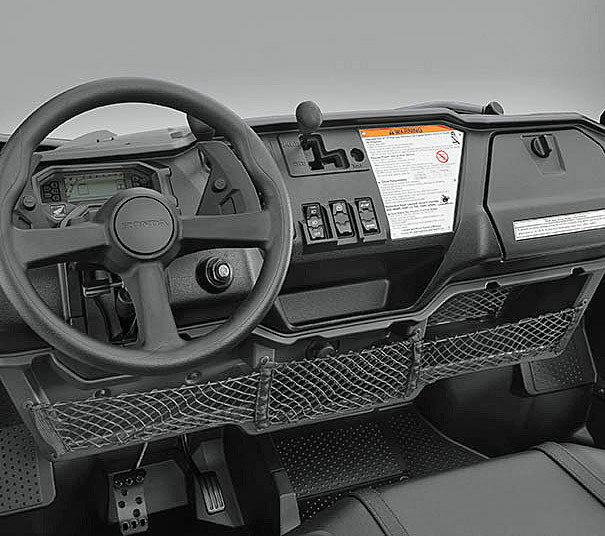 Hydraulic assist tilt bed lever that can be accessed from outside the vehicle, or right from the driver’s seat. Standard 2 inch receiver hitch. Contoured for three passengers, the center seat is positioned up and forward to maximize space and comfort, and the covering is designed to resist both the elements and heavy use. The multi-function LCD dash display is large enough to host loads of information, in an easy-to-read way, like speed and fuel level. RPM and transmission mode. Fuel gauge, water temperature, trip information, clock and more. Want to bring an extra one or two passengers along for the ride? 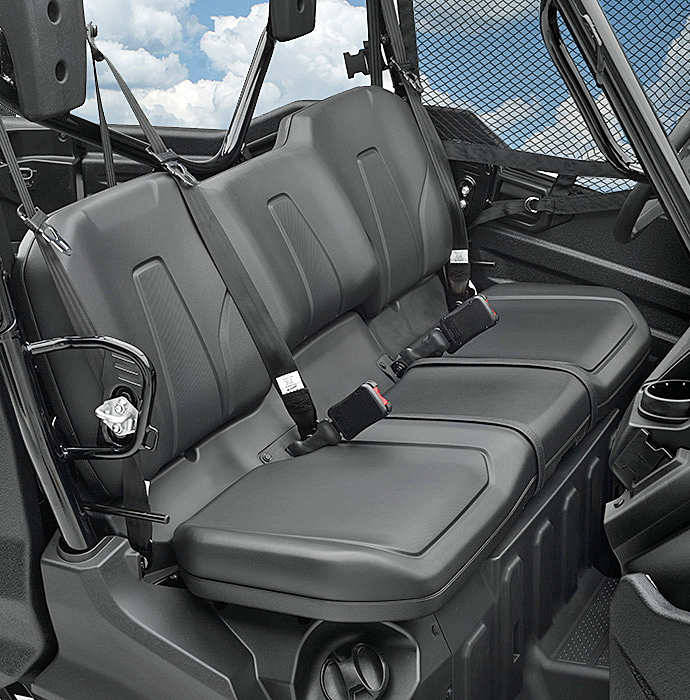 Two QuickFlip seats pop up from the cargo bed on Pioneer 1000-5, giving you the extra seating you need, when you need it. 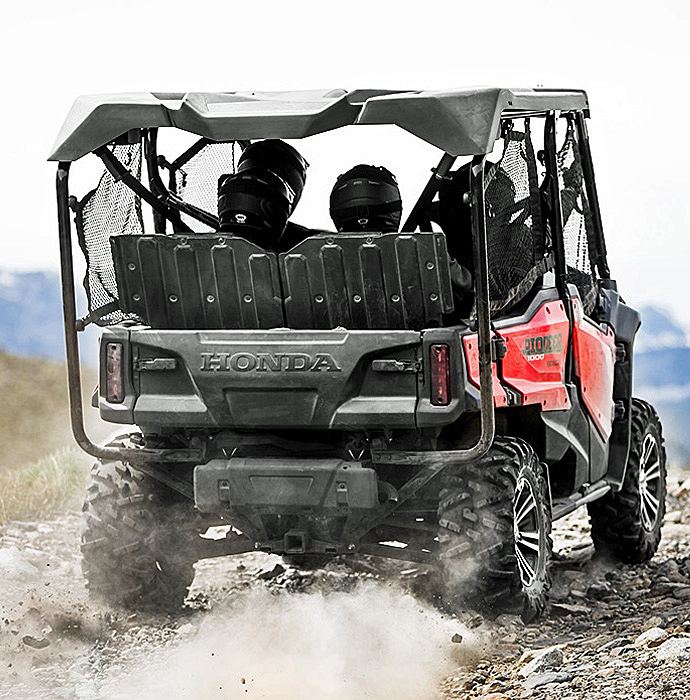 Exclusive to Honda, it’s a smarter system than fixed seat, multi-row models, giving you better maneuverability on the trails. Tilt Wheel and paddle shifters on EPS model. LE with I-4wd and underdash storage.